Microgaming’s 5-reel, 243-ways-to-win progressive jackpot slot has a dark theme based on the 2008 Hollywood blockbuster, with plenty of bonuses and a Mega jackpot that’s no joke! 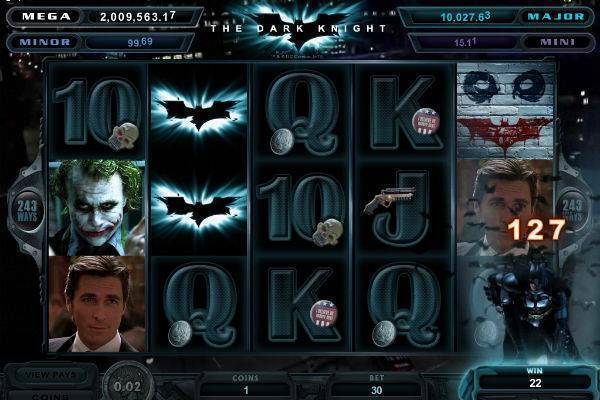 The Dark Knight is a well-invested slot, with film clips which play when you win. The base game is filled with surprises: when Batman or the Joker appear, expect stunning surprises, including cash awards, free spins, and reels of wilds along with generous win multipliers. A chance at the jackpot also appears randomly, giving you a spin on a wheel of fortune with a chance to hit one of the 4 levels of Big Win. The more you bet, the more you can win. Check out this exciting slot at one of our recommended casinos. Coin value starts at 30p and ranges up to £6. 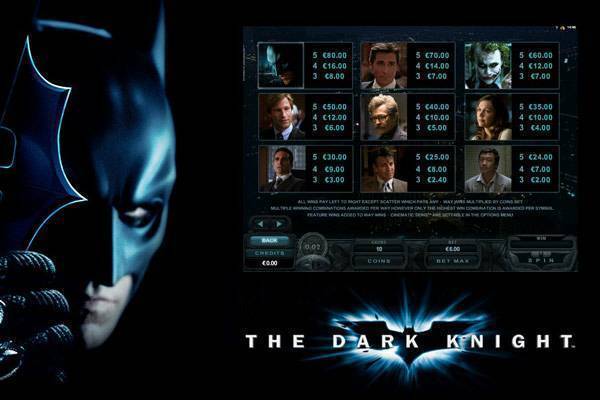 Once you’ve decided on your bet size, The Dark Knight game is ready to begin. This is a 243 Ways to Win game, which means that 3 or more matching symbols in a row is a winner. Payouts are proportional to your bet value. You also have a full set of autoplay options. Wild: the familiar Bat symbol, and it can stack randomly into a full-reel wild. Scatter: a spray-painted Joker face on a wall with the Bat symbol as his smile. Landing 3 or more will trigger the Free Spins sequence, and even a pair in a row will win you a cash prize. The chance at the Dark Knight jackpot is awarded randomly. You are transported to a Wheel of Fortune game, where you have a chance to spin for prizes. There are 4 levels of jackpot available: Mini (starting from £10), Minor (starting from £100), Major (starting at £10,000) and – last but not least – Mega, which seeds at a whopping £1 million and has been known to reach 8 figures The Mega offers the largest jackpot and can occasionally climb up to the eight figure mark. The bonus is triggered randomly throughout gameplay: just choose Batman or the Joker, and hope for a big prize, especially a big jackpot. Batman-Joker Cash: When Batman or Joker appear randomly in the base game, expect surprises, including cold hard cash. Symbol Scramble: Symbols rearrange to form winning combinations. This feature happens randomly. Free Spins Accumulator: Increases the number of Free Spins and also happens randomly. Super Stacked Wilds: turn one or more entire reels wild. Rolling Reels: give an extra turn to form winning combinations. Heat Seeking Wilds: a missile flies above the reels, hitting a symbol and turning it wild. Extra Wild Blast: Multiple Symbols explosively turn wild. Microgaming clearly paid a pretty penny for the rights to use theme, images, and clips from this Hollywood blockbuster. They also invested in making this slot conjure something of the cinematic experience. There are complex animations involving Batman and the Joker performing various stunts above and beside the reels. Still, the novelty of being rewarded with long film clips when you win may wear off, so happily you have the option to turn this feature off to speed up the game action. Overall, the deep-bass sounds are well above average and convey the movie’s dark and brooding tone. Gameplay is smooth and entertaining. 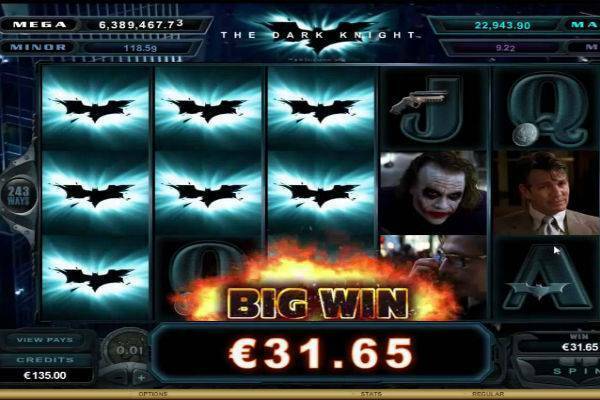 The Dark Knight slot from Microgaming does justice to the billion-grossing Hollywood hit. This is a more than a decent game packed with exciting bonus features. Once you get to the free spins sequence, your wins can stack up and multiply rapidly. With a random shot at a potential mammoth mega jackpot, this is a progressive well worth playing at a reputable casino.